The day was rather attractive and full of interesting results. The day ended with defeat of the leader and favorites losing the games. Here is the last day review presented by ESL. Top ranked Bucks (41-14) recorded its fourteenth loss in Orlando on Saturday night. Visitors were rolled over by fourth ranked Magic (24-32) 103-83. It ended at the same time the six-game winning streak of Bucks. Magic looked well-organized offensively handing out 28 assists. Great defensive blocking was one of the keys in this match when Magic made 8 blocks. Montenegrin center Nikola Vucevic (213-90, college: USC) fired a double-double by scoring 15 points, 17 rebounds and 5 assists for the winners. Forward Jonathan Isaac (209-97, college: Florida St.) chipped in 17 points and 6 rebounds. point guard Eric Bledsoe (185-89, college: Kentucky) produced a double-double by scoring 19 points, 11 rebounds and 5 assists for lost side. Both coaches used bench players which allowed the starters a little rest for the next games. Magic moved-up to third place, which they share with Washington W. Bucks at the other side still keep top position with 14 games lost. Magic is looking forward to face Hawks (#5) in Atlanta in the next day. Bucks will have a break next day. Very important is a home loss of second ranked Spurs (32-26) against fourth ranked Jazz (32-24) on Saturday night. Host Spurs were crushed by Jazz in San Antonio 125-105. Worth to mention a great performance of French center Rudy Gobert (216-92) who helped to win the game recording a double-double by scoring 21 points, 13 rebounds and 4 assists (on 8-of-10 shooting from the field). Donovan Mitchell contributed with 23 points, 5 rebounds and 5 assists for the winners. Swingman DeMar DeRozan (201-89, college: USC) answered with 23 points and 5 assists for Spurs. Both coaches tested many bench players and allowed the starting five to rest. Jazz maintains fourth place with 32-24 record. Spurs lost fourth consecutive game. They keep the second position with 26 games lost. An exciting game was played in Los Angeles. Second ranked Clippers faced their close opponent Celtics. Host Clippers (31-26) defeated guests from Boston (35-21) 123-112. It was a key game for the second position in the league. It was a great evening for Danilo Gallinari who led his team to a victory with a double-double by scoring 19 points, 10 rebounds and 4 assists (made all of his seven free throws). At the losing side Gordon Hayward responded with 19 points and 5 rebounds. Both coaches allowed to play bench players saving starting five for next games. Clippers maintains second place with 31-26 record having just six point less than leader Toronto R. Loser Celtics dropped to the third position with 21 games lost. An exciting game was played in Washington. Third ranked Wizards faced 4th placed Bulls. Host Wizards (24-32) defeated guests from Chicago (13-43) 134-125. It was an exceptional evening for Bradley Beal who led the winners and scored 31 points and 4 assists. Both coaches allowed to play bench players saving starting five for next games. Wizards maintains third place with 24-32 record having just two points less than leader Toronto R., which they share with Orlando M. Bulls at the other side keep the fourth position with 43 games lost. An exciting game was played in Oklahoma City. Second ranked Thunder faced leader Rockets. Host Thunder (36-19) defeated guests from Houston (32-23) 117-112. It ended at the same time the three-game winning streak of Rockets. Paul George fired a double-double by scoring 45 points (!!!) and 11 rebounds for the winners. Thunder's coach used a ten-player rotation in such tough game. They have a solid series of three victories in a row. Thunder maintains second place with 36-19 record having just nine point less than leader Toronto R. Loser Rockets still keep top position with 23 games lost. New York K. were defeated by Toronto R. in a road game 104-99. Charlotte H. beat Atlanta H. at home 129-120. Indiana P. won against Cleveland C. on the opponent's court 105-90. N.Orleans P. unfortunately lost to Memphis G. in a home game 90-99. There was no surprise in Toronto where 5th ranked Knicks (10-45) were defeated by first ranked Raptors (41-16) 104-99 on Saturday. However just five-point win is not that big difference and the fans of host team counted on more convincing victory. Raptors made 24-of-29 free shots (82.8 percent) during the game. They looked well-organized offensively handing out 27 assists. Knicks were plagued by 26 personal fouls down the stretch. Congolese-Spanish power forward Serge Ibaka (208-89) fired a double-double by scoring 15 points, 13 rebounds and 4 assists for the winners. Point guard Kyle Lowry (183-86, college: Villanova) chipped in 22 points and 5 assists. Raptors' coach used a ten-player rotation in such tough game. Center DeAndre Jordan (211-88, college: Texas A&M) produced a double-double by scoring 10 points and 18 rebounds and Kevin Knox-II (206-99, college: Kentucky) added 20 points respectively for lost side. Both teams had five players each who scored in double figures. They have a solid series of four victories in a row. Raptors maintains first place with 41-16 record. Knicks lost sixteenth consecutive game. They keep the fifth position with 45 games lost. Very important is a home loss of second ranked Spurs (32-26) against fourth ranked Jazz (32-24) on Saturday night. Host Spurs were crushed by Jazz in San Antonio 125-105. They outrebounded Spurs 52-36 including a 43-31 advantage in defensive rebounds. Jazz players were unselfish on offense dishing 29 assists. Worth to mention a great performance of French center Rudy Gobert (216-92) who helped to win the game recording a double-double by scoring 21 points, 13 rebounds and 4 assists (on 8-of-10 shooting from the field). Guard Donovan Mitchell (190-96, college: Louisville) contributed with 23 points, 5 rebounds and 5 assists for the winners. Swingman DeMar DeRozan (201-89, college: USC) answered with 23 points and 5 assists and power forward LaMarcus Aldridge (211-85, college: Texas) added 15 points, 10 rebounds and 4 assists in the effort for Spurs. Both teams had five players each who scored in double figures. Both coaches tested many bench players and allowed the starting five to rest. Jazz maintains fourth place with 32-24 record. Spurs lost fourth consecutive game. They keep the second position with 26 games lost. An exciting game was played in Los Angeles. Second ranked Clippers faced their close opponent Celtics. Host Clippers (31-26) defeated guests from Boston (35-21) 123-112. It was a key game for the second position in the league. Clippers made 31-of-40 free shots (77.5 percent) during the game. They looked well-organized offensively handing out 28 assists. It was a great evening for Italian Danilo Gallinari (208-88) who led his team to a victory with a double-double by scoring 19 points, 10 rebounds and 4 assists (made all of his seven free throws). Forward Montrezl Harrell (203-94, college: Louisville) helped adding 21 points and 6 rebounds. At the losing side swingman Gordon Hayward (203-90, college: Butler) responded with 19 points and 5 rebounds and forward Jayson Tatum (203-98, college: Duke) scored 16 points and 8 rebounds. Both teams had five players each who scored in double figures. Both coaches allowed to play bench players saving starting five for next games. 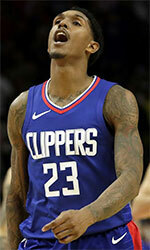 Clippers maintains second place with 31-26 record having just six point less than leader Toronto R. Loser Celtics dropped to the third position with 21 games lost. No shocking result in a game in Charlotte where first ranked Hornets (27-28) defeated 5th ranked Hawks (18-37) 129-120 on Saturday. Hornets looked well-organized offensively handing out 30 assists. Great defensive blocking was one of the keys in this match when Hornets made 7 blocks. Point guard Kemba Walker (185-90, college: Connecticut) fired 37 points (!!!) and 7 assists for the winners. Jeremy Lamb (196-92, college: Connecticut) chipped in 24 points, 6 rebounds and 7 assists. Guard Trae Young (188-98, college: Oklahoma) produced a double-double by scoring 20 points and 11 assists and U.S. Virgin Islands-American John Collins (208-97, college: Wake Forest) added 21 points and 5 rebounds respectively for lost side. Four Hornets and five Hawks players scored in double figures. Both coaches allowed to play bench players saving starting five for next games. Hornets maintains first place with 27-28 record. Loser Hawks keep the fifth position with 37 games lost. Hornets will have a break next day. Hawks will play at home against Magic (#4) and it may be a tough game between close rivals. Rather expected game in Cleveland where 5th ranked Cavaliers (11-45) were defeated by second ranked Pacers (37-19) 105-90 on Saturday. Pacers dominated down low during the game scoring 72 of its points in the paint compared to Cavaliers' 38. They outrebounded Cavaliers 43-30 including a 37-25 advantage in defensive rebounds. Pacers looked well-organized offensively handing out 31 assists. Canadian point guard Cory Joseph (190-91, college: Texas) fired a double-double by scoring 10 points, 9 rebounds and 10 assists for the winners. Point guard Darren Collison (183-87, college: UCLA) chipped in 18 points and 9 assists. Five Pacers players scored in double figures. Forward Larry Nance-Jr (203-93, college: Wyoming) produced a double-double by scoring 16 points and 10 rebounds and American-Filipino guard Jordan Clarkson (196-92, college: Missouri) added 18 points and 6 assists respectively for lost side. Both coaches allowed to play bench players saving starting five for next games. Pacers have an impressive series of five victories in a row. They maintain second place with 37-19 record having just eleven point less than leader Toronto R. Cavaliers lost fourth consecutive game. They keep the fifth position with 45 games lost. We could consider it a predictable result in the game between close teams in New Orleans where fifth ranked Grizzlies (23-34) beat 4th placed Pelicans (25-32) 99-90 on Saturday. Grizzlies looked well-organized offensively handing out 27 assists. French-American power forward Joakim Noah (211-85, college: Florida) fired a double-double by scoring 19 points and 14 rebounds for the winners. Point guard Mike Conley (185-87, college: Ohio St.) chipped in 11 points, 6 rebounds and 9 assists. Center Anthony Davis (208-93, college: Kentucky) produced a double-double by scoring 14 points, 16 rebounds and 6 assists and guard Kenrich Williams (201-94, college: TCU, agency: Pensack Sports) added 10 points, 13 rebounds and 7 assists respectively for lost side. Five Grizzlies and four Pelicans players scored in double figures. Both coaches allowed to play bench players saving starting five for next games. Grizzlies maintains fifth place with 23-34 record. Loser Pelicans keep the fourth position with 32 games lost. Top ranked Bucks (41-14) recorded its fourteenth loss in Orlando on Saturday night. Visitors were rolled over by fourth ranked Magic (24-32) 103-83. It ended at the same time the six-game winning streak of Bucks. Magic looked well-organized offensively handing out 28 assists. Great defensive blocking was one of the keys in this match when Magic made 8 blocks. Montenegrin center Nikola Vucevic (213-90, college: USC) fired a double-double by scoring 15 points, 17 rebounds and 5 assists for the winners. Forward Jonathan Isaac (209-97, college: Florida St.) chipped in 17 points and 6 rebounds. Four Magic players scored in double figures. Point guard Eric Bledsoe (185-89, college: Kentucky) produced a double-double by scoring 19 points, 11 rebounds and 5 assists and forward Khris Middleton (203-91, college: Texas A&M) added 11 points, 12 rebounds and 4 assists respectively for lost side. Both coaches used bench players which allowed the starters a little rest for the next games. Magic moved-up to third place, which they share with Washington W. Bucks at the other side still keep top position with 14 games lost. Magic is looking forward to face Hawks (#5) in Atlanta in the next day. Bucks will have a break next day. An exciting game was played in Washington. Third ranked Wizards faced 4th placed Bulls. Host Wizards (24-32) defeated guests from Chicago (13-43) 134-125. Wizards players were unselfish on offense dishing 38 assists. It was an exceptional evening for Bradley Beal (196-93, college: Florida) who led the winners and scored 31 points and 4 assists. Forward Jabari Parker (203-95, college: Duke) accounted for 20 points, 5 rebounds and 6 assists for the winning side. Guard Zach LaVine (196-95, college: UCLA) came up with 26 points and 6 assists and Finnish Lauri Markkanen (216-97, college: Arizona) added 20 points, 11 rebounds and 4 assists respectively for Bulls in the defeat. Four Wizards and five Bulls players scored in double figures. Both coaches allowed to play bench players saving starting five for next games. Wizards maintains third place with 24-32 record having just two points less than leader Toronto R., which they share with Orlando M. Bulls at the other side keep the fourth position with 43 games lost. An exciting game was played in Oklahoma City. Second ranked Thunder faced leader Rockets. Host Thunder (36-19) defeated guests from Houston (32-23) 117-112. It ended at the same time the three-game winning streak of Rockets. Thunder made 24-of-30 free shots (80.0 percent) during the game. They outrebounded Rockets 53-39 including 41 on the defensive glass. Rockets were plagued by 26 personal fouls down the stretch. Swingman Paul George (206-90, college: Fresno St.) fired a double-double by scoring 45 points (!!!) and 11 rebounds for the winners. Point guard Russell Westbrook (190-88, college: UCLA) chipped in a triple-double by scoring 21 points, 12 rebounds and 11 assists. Thunder's coach used a ten-player rotation in such tough game. James Harden (196-89, college: Arizona St.) produced 42 points (!!!) and point guard Chris Paul (183-85, college: Wake Forest) added 18 points, 10 rebounds and 9 assists respectively for lost side. Four Thunder and five Rockets players scored in double figures. They have a solid series of three victories in a row. Thunder maintains second place with 36-19 record having just nine point less than leader Toronto R. Loser Rockets still keep top position with 23 games lost.